his month marks the 30th anniversary of The Dragonbone Chair, first volume in the immensely influential “Memory, Sorrow, and Thorn” fantasy series written by Tad Williams. The first volume was published on October 25th, 1988, and it soon became a national bestseller, inspiring fantasy authors George R. R. Martin, Patrick Rothfuss, and Christopher Paolini to write their own hugely successful series, and in the process changing the landscape of fantasy fiction. Writing for Barnes and Noble, Aidan Moher states, “Williams’ trilogy is quietly one of the most influential fantasies of the past 30 years, and is, in large part, responsible for the resurgence in the mainstream popularity of fantasy via HBO’s Game of Thrones, the television adaptation of Martin’s hugely popular A Song of Ice and Fire novels—after all, Martin credits Williams’ books as a primary inspiration. The Dragonbone Chair was followed by sequels Stone of Farewell (1990) and To Green Angel Tower (1993), and nearly three decades later by The Heart of What Was Lost (2017), The Witchwood Crown (2017), and the forthcoming Empire of Grass, The Navigator’s Children, The Shadow of Things to Come, as well as a few stand-alone stories, each set in Williams’ world of Osten Ard. Williams will be honored as the Writer Guest of Honor at the 2019 World Fantasy Convention. As a way of celebrating the 30th anniversary of this seminal series, artist Jessica Steinke has created a beautiful illustration from The Witchwood Crown, showing the sleeping Queen of the Sithi, Likimeya y-Briseyu no’e-Sa’onserei. (The full resolution version of the piece is available on DeviantArt). We at Treacherous Paths are honored to showcase Steinke’s beautiful art work as the fantasy world celebrates 30 years of Williams’ Osten Ard novels. 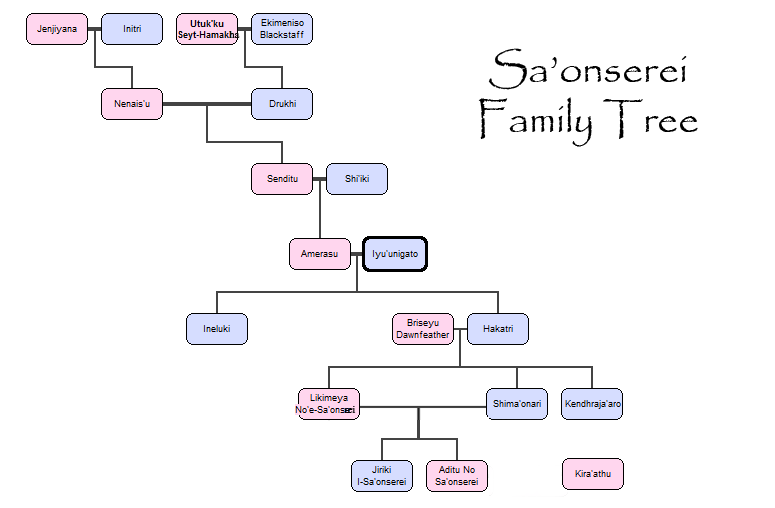 Here is an infographic showing the family tree of House Year-dancing, also known as House Sa’onserei, the ruling house of the Sithi. The text indicates that Shima’onari and Likimeya may be siblings in addition to being husband and wife. This may be an error in the appendix. Jiriki describes Kira’athu as his cousin on page 682 of To Green Angel Tower, part one, but her parentage is not clear. Jiriki refers to An’nai as his kinsman, but An’nai’s relationship to House Sa’onserei remains unclear.